It would seem the two pullback racers of 2013 were well accepted enough for TLG to do another pair for 2014. 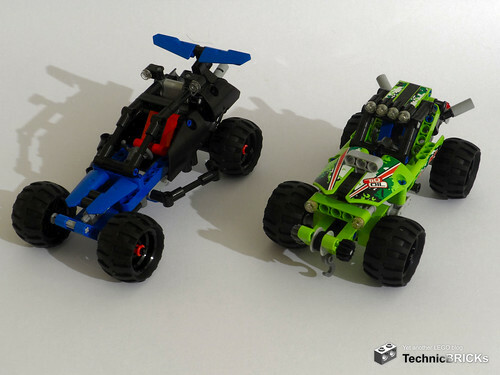 Teaming up with the 42010 Off-road Racer and the 42011 Race Car, 2014 will bring us the 42026 Black Champion Racer and the 42027 Desert Racer. 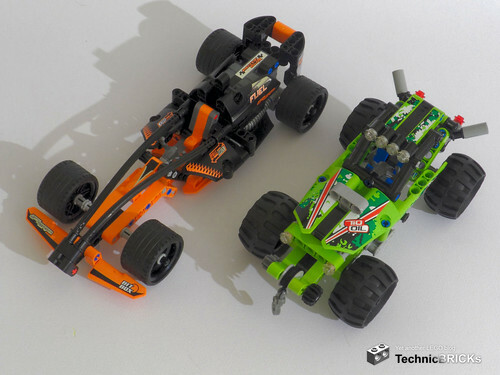 The theme is the same: a Formula 1-like race car, and a dune buggy. Shall we check them out? 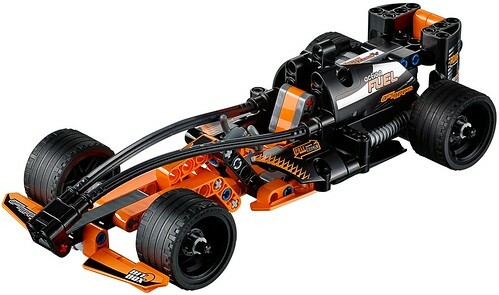 First, let's see the 42026, the Black Champion Racer. 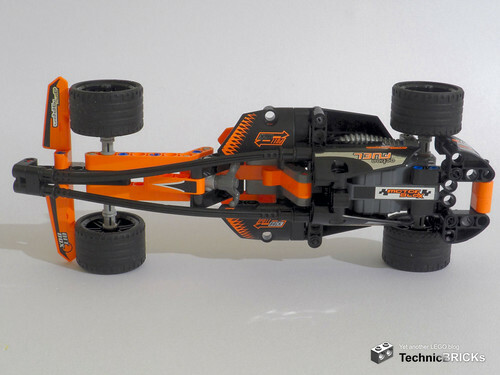 It's a black and orange Formula One car, with a modern look. 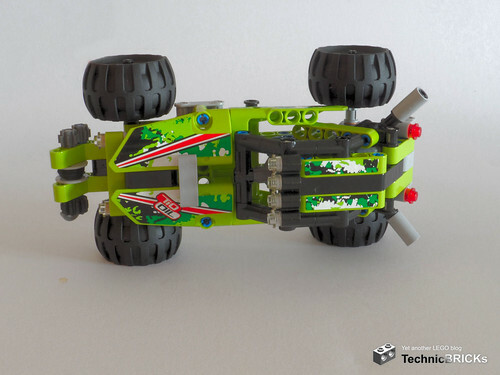 Like its predecessor, its function is provided by the pull-back motor: you pull the car back a bit, let it go, and it zooms away for a considerable distance. 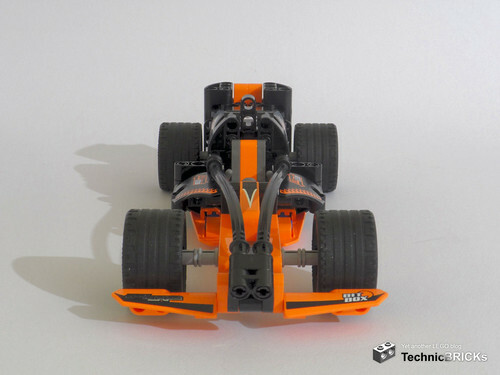 Unlike its predecessor, however, it is inspired by modern F1 cars, as can be seen by the "raised nose", wide front spoiler, narrow rear spoiler, and same-sized wheels. 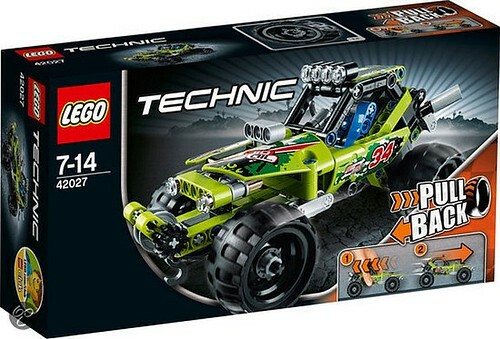 Then there's the 42027, the Desert Racer. 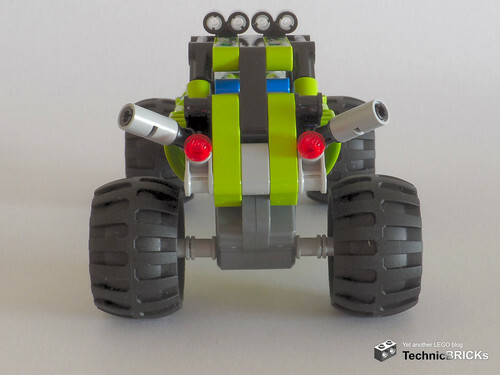 This is an all-terrain vehicle dressed in lime green. Again, similarly to its ancestor, besides the pull-back action, it can open its cockpit for its driver to enter and leave. In addition, it has a functional winch at the front. 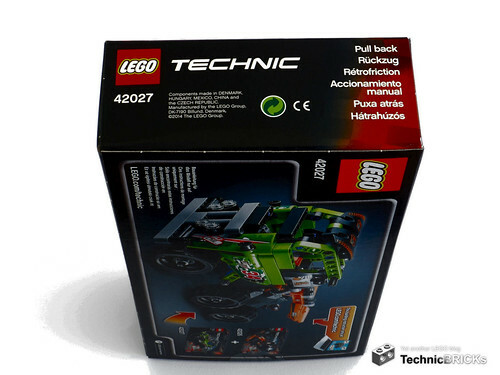 Compared to the 42010, I'd say it represents a vehicle less designed for speed and more for toughness, something confirmed by the presence of the winch. 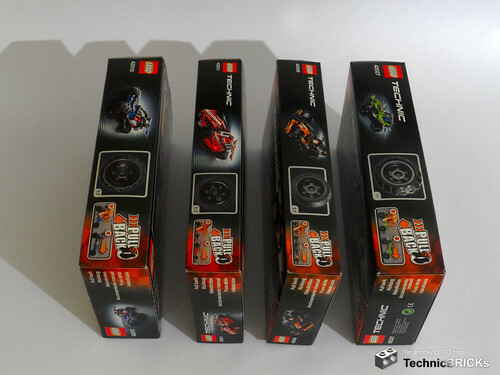 Both boxes have the same height and width, but, despite having the same Shop@Home price, the box for the Desert Racer is thicker than the one for the Black Champion Racer. This is odd, considering the added thickness doesn't add any necessary space for the parts, and the finished model still doesn't fit inside. 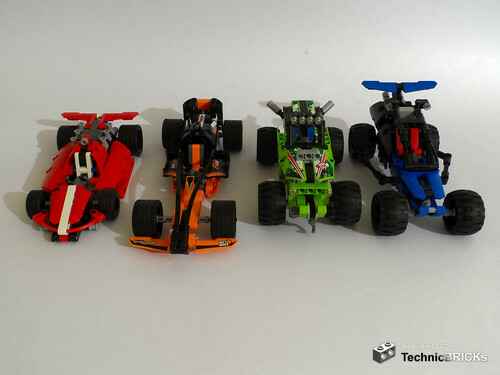 The same happens with the 2013 racers. 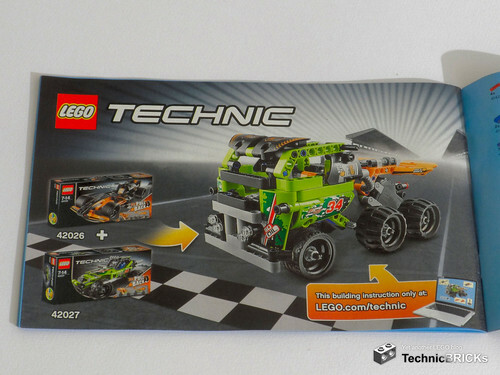 I fear this will again give some shops an excuse to make one of the sets more expensive than the other. The back of both boxes is exactly the same. 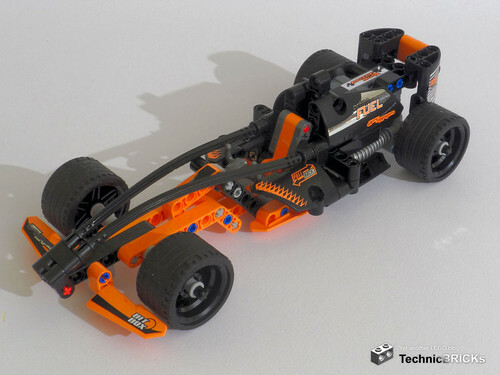 It shows the B-model that can be built using parts from both sets, namely a Racing Truck. 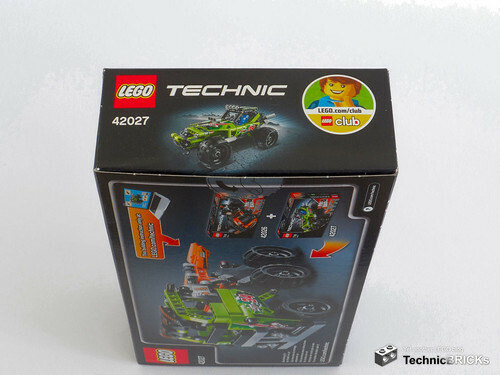 Besides the need to have both 42026 and 42027, the box also mentions that the instructions can only be found online. The sides, tops and bottoms of both boxes are the usual affairs, each using one wheel for the 1:1 reference. 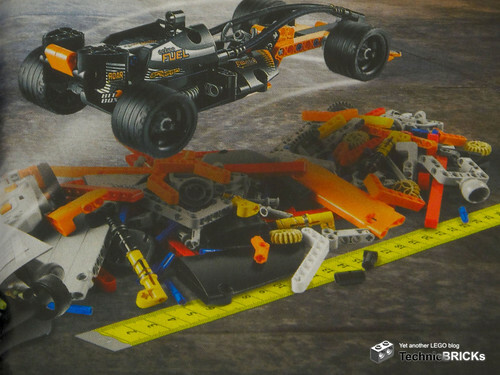 Now, delving deeper into the boxes' contents, starting with the Black Champion Racer... After opening the box and dumping its contents, we are greeted to two bags with parts, four loose tyres, three equally loose flexible axles, one instruction booklet, a (in my case, very crumpled) leaflet containing play suggestions, and a DSS. 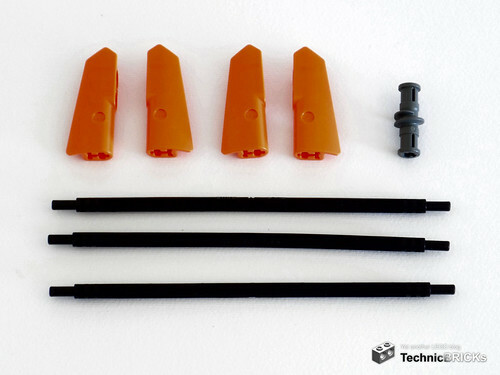 Orange and black are the prominent colours in the large bag, while the smaller one, which as expected contains mostly connectors and other doodads, has more colours. 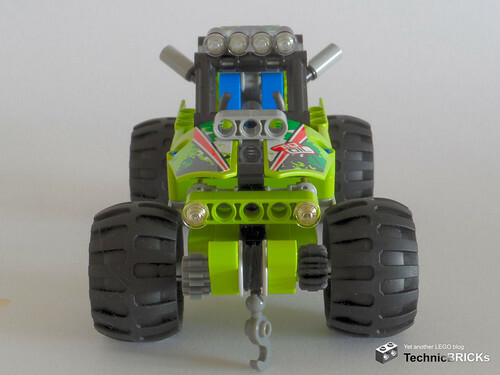 The DSS has the particularity of being printed on a chrome background, which, as a significant area is still left over after removing all stickers, could be useful for adding detail to MOC's. 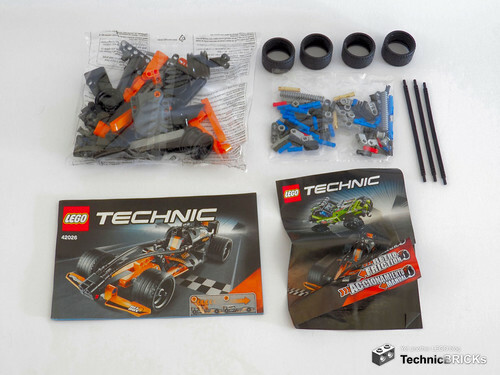 The Desert Racer's box contents are slightly similar, with a big bag of parts, a small bag of parts, some loose parts, an instruction booklet, a suggestions leaflet and a DSS. 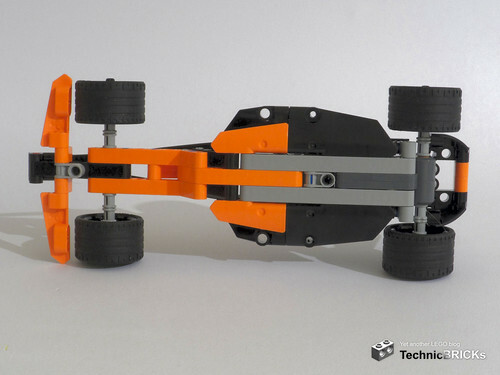 In this case, however, instead of soft axles, the pull-back motor is what accompanies the tyres on their prance outside the bags. 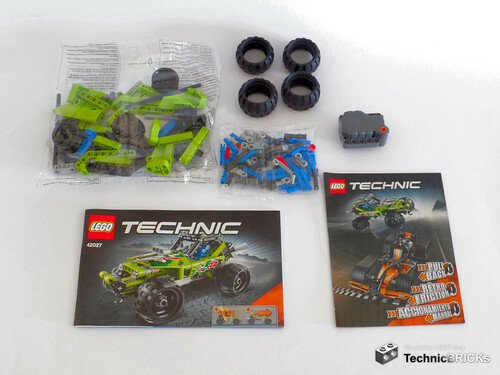 As expected, the inside of the large bag, which contains the parts most responsible for defining the model, is mostly lime green. Unlike the Black Champion Racer, the background of the DSS is the standard white. 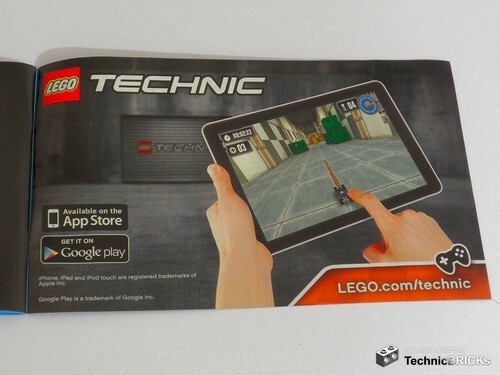 The leaflet shows two play suggestions for the models: you can see how high or how long you can make them jump. I'm sure you'll think of other fun stuff to do with them, like seeing how long it takes for your cat to stop paying attention to that (hopefully) inedible thing that moves quickly and then stops. 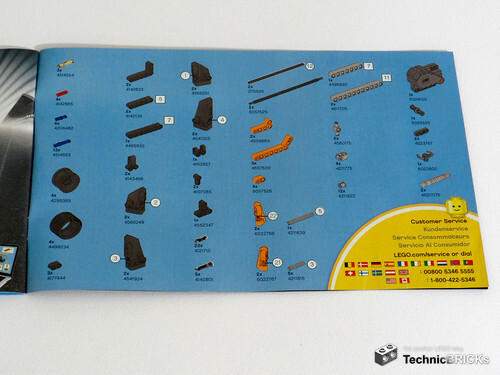 Here's a close-up of the leaflet, in case you want to try finding any previously unknown parts. 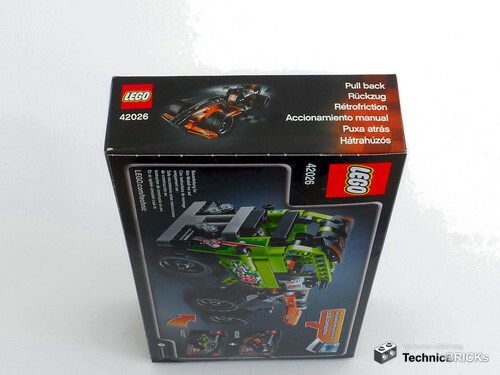 However, since the same pile of parts is used for the 2013 pull-back racers and they appear to come from a 8110 Mercedes-Benz Unimog U400, I doubt so. 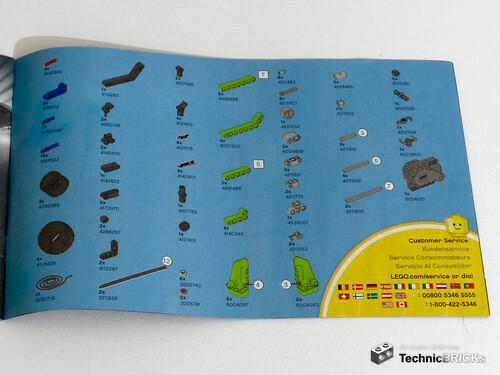 The models themselves don't contain any new parts for 2014, but each set includes an extra part for the combined B-model. 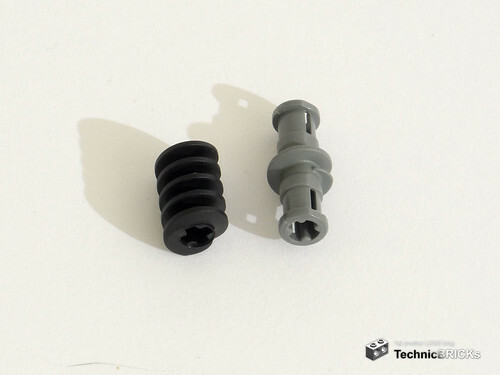 In both cases, this extra part is the new worm screw (LEGO ID #6055555), in dark bluish grey. 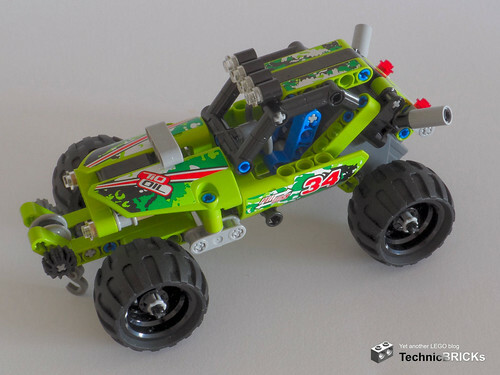 As can be immediately guessed, the new version of the classic that survived unchanged for more than 25 years is now 3 studs (or, using the official TLG vocabulary, "modules") long. 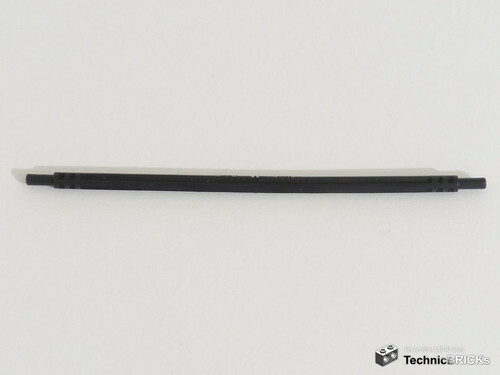 This length is achieved by a bush-like portion at each end, and the worm itself in the middle. This makes the "screw" part 1 stud long, half the older version. Peeking through one of the axle holes, we see an important novelty: now an axle can't be run through its full length, and can only be inserted 1 stud deep. This will bring significant changes to the way we use worms. There's another change. 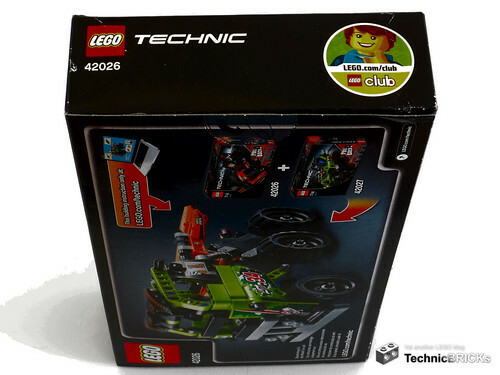 While the old part could easily slide along its axle (something never exploited on official LEGO models, but often used in MOC's like this classic), all this ends with the new one. 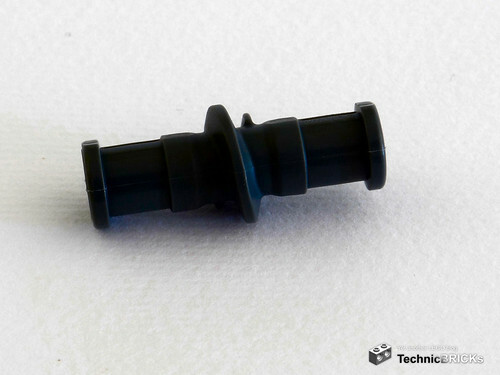 Not only there's the aforementioned internal stop preventing axles from running through it, but also the "grip" on an inserted axle is now as strong as other axle hole-equipped parts. 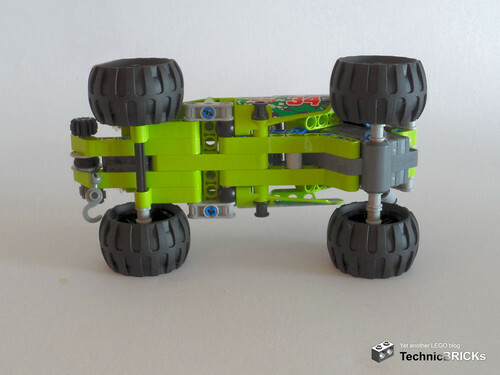 There's considerable friction and, if you hold an axle with an attached new worm, it won't fall off. 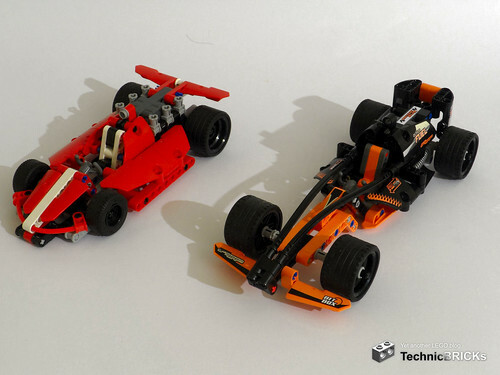 Still, I hope the old mould isn't discontinued, as both new and old have their advantages and disadvantages. 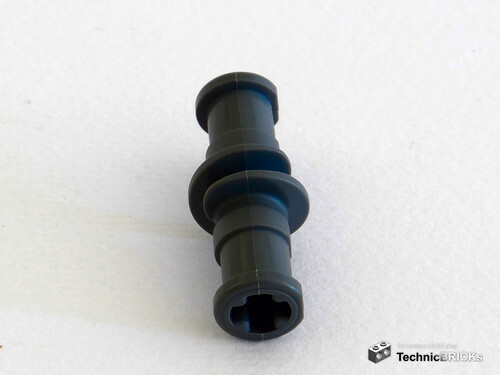 Besides the new mould, the Black Champion Racer contains an existing part in a new colour. 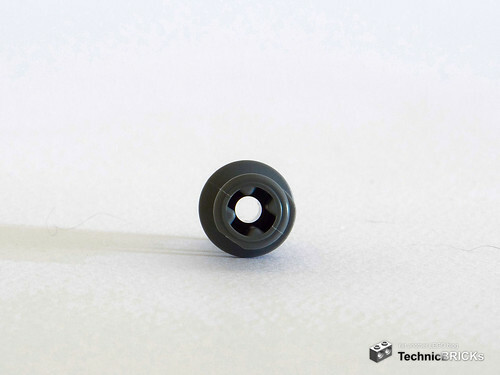 It's the 16L flexible axle, never before seen in black (LEGO ID #6057525). 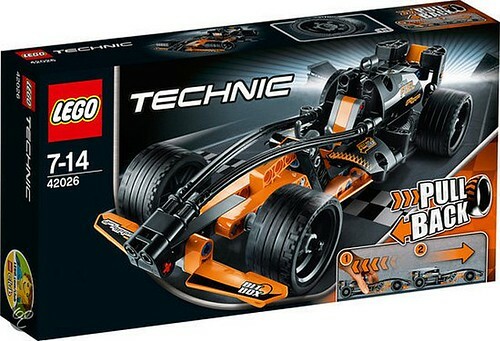 This should make the set quite interesting to some renowned LEGO car designers! 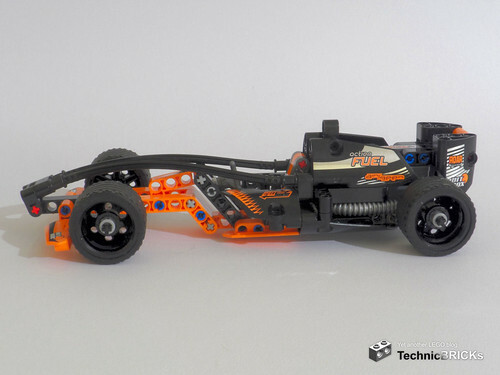 Here is the building process of the Black Champion Racer. 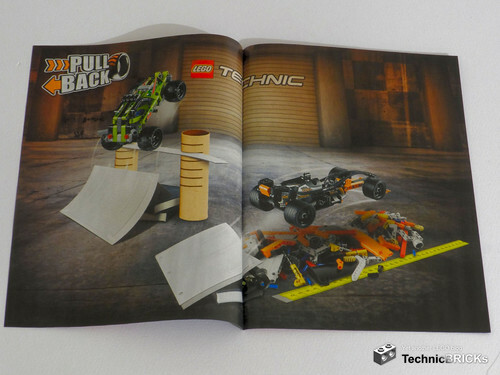 When building the sets, I encountered just one surprise: the inclusion, in the bottom of Desert Racer, of a pair of the above shown Technic balls in a place that could easily use standard bushes. I don't see any use for them here, maybe they're somehow needed for the B-model? 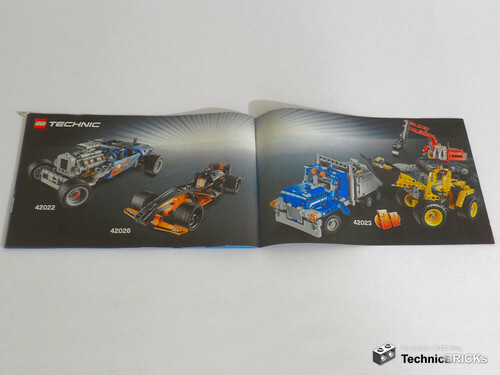 The last pages of both booklets show the combined sets' B-model, and some of the rest of the 1H2014 Technic assortment: the 42022 Hot Rod, the 42023 Construction Crew, and either the 42026 Black Champion Racer or the 42027 Desert Racer. Finally, there's also mention of what appears to be a game for mobile devices. From the image, I'd say it’s a virtual version of the pull-back models, in which you have to go through a course by choosing how much to pull back and in what direction. 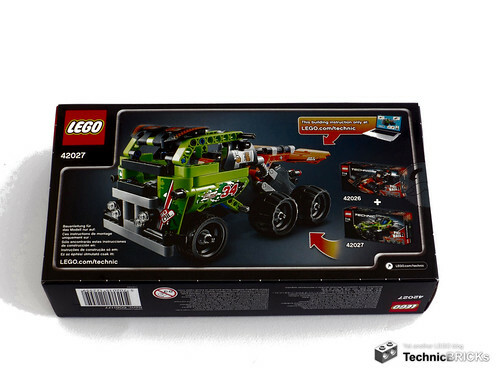 Both sets are very solid, with no parts that can fly off easily. 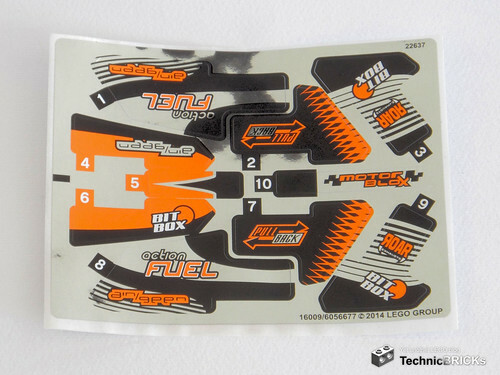 In addition, even without stickers, they also have good looks for when it's time to return to the shelf. 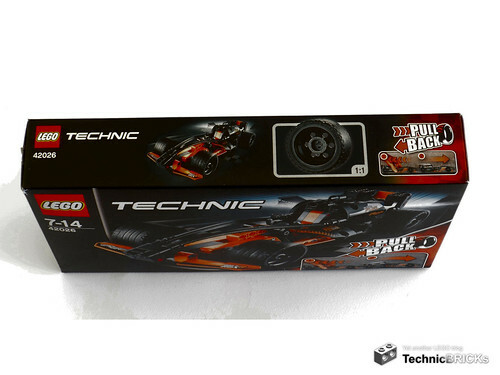 The Black Champion Racer has flowing, smooth curves and the detail of the exhaust pipes beneath the engine. The Desert Racer has plenty of headlights for night driving in the wilderness, and the winch helps with the "I'm ready for anything" look. 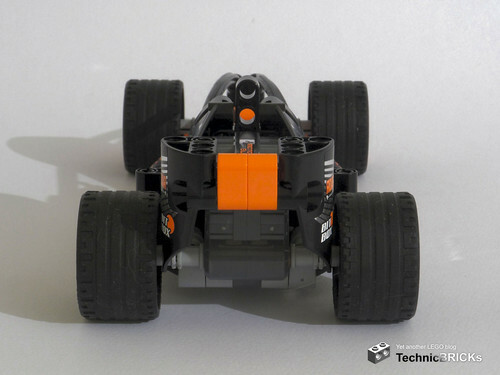 I'm just not too fond of the Black Champion Racer's bottom: while the panels underneath give it a realistic smooth look, the micro panels should be black instead of orange for less colour clash. 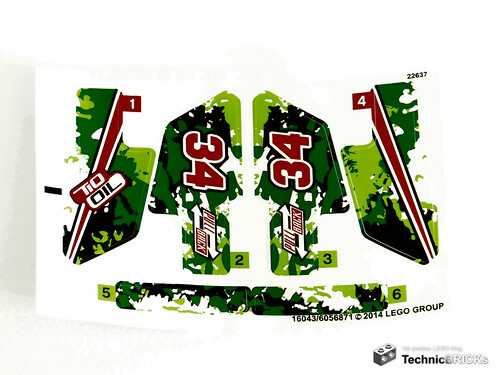 Like the pull-back sets for 2013, the new ones have a combined B-model. 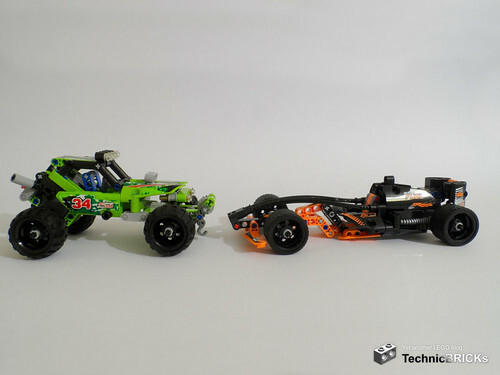 Now, instead of a dragster, we can build a 6-wheeled racing truck, which uses both pull-back motors. 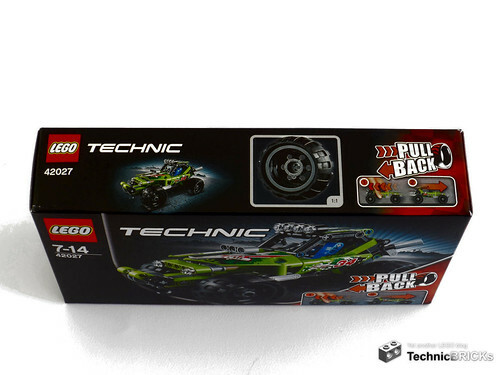 It presumably uses one of the new worm gears to adjust the pitch of the rear spoiler, while the other worm is nowhere to be seen in the image at the back of the sets' boxes. 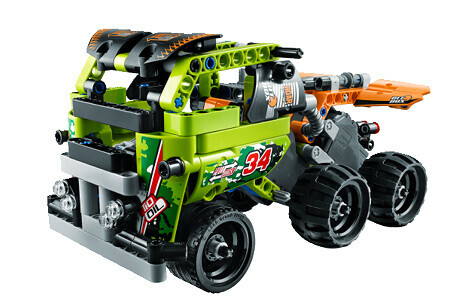 Combining the Black Champion Racer's orange with the Desert Racer's lime results in a quite Power Miners-esque colour scheme! 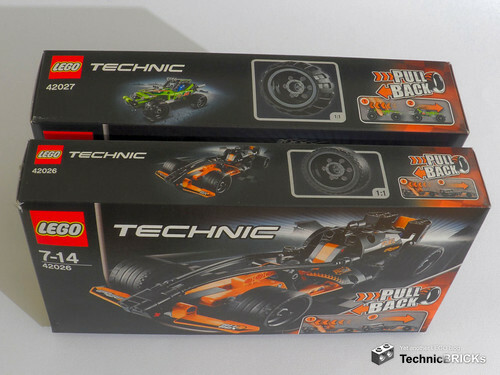 Now with four sets and using reference numbers quite distinct from the rest of the Technic line, I'd say the pull-back almost constitute a sub-theme... if the trend continues, will we see in 2015 a yellow car for racing circuits paired with a green off-road vehicle? That would complement the colour spectrum quite well. 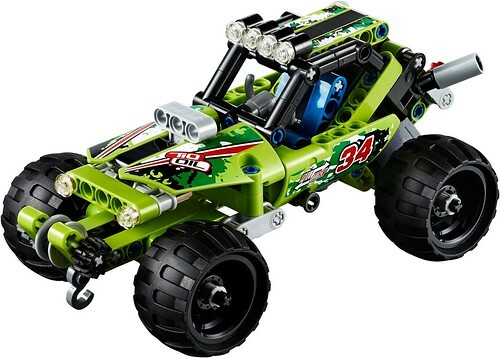 If you're just looking for racing and cat annoyance, and already have any of the 2013 pull-back racers, the new ones don't bring anything significantly new. 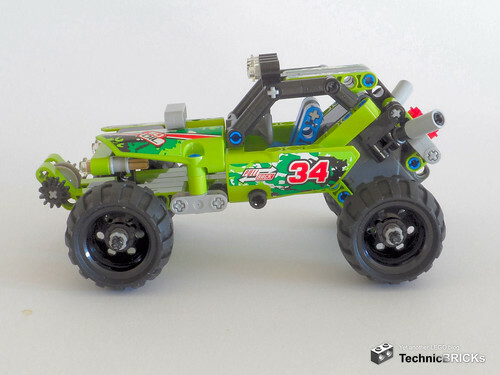 I don't think the addition of the winch on the Desert Racer is enough for it to be worth buying it. 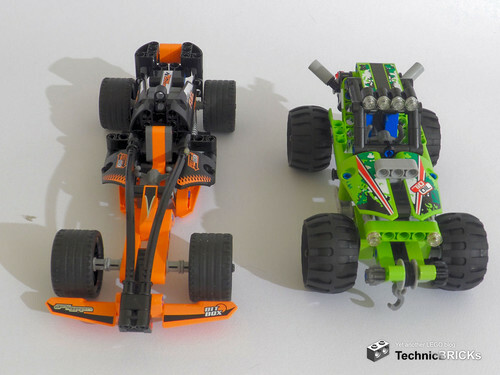 On the other hand, these new sets go great with their predecessors, and now you can choose to make competitions between track racers or between off-road racers. 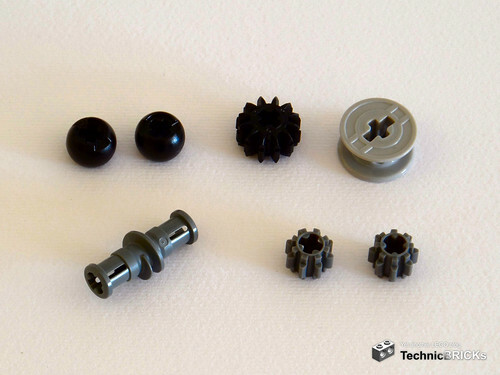 While there aren't so many new parts in the sets, they bring some unusual ones (the new-style 8T gears on the Desert Racer and especially the black 16L flex axles on the Black Champion Racer). While both sets are quite equivalent in value, I think its objective differences make it worthwhile to have separate ratings. As for the subjective aspects: while I, a mild fan of off-road, like the Desert racer more, my dad (who is also an AFOL), who likes F1 more, loved the Black Champion Racer on first sight. This diversity of opinion confirms that it was wise for TLG to make different kinds of vehicles instead of focusing on just one. 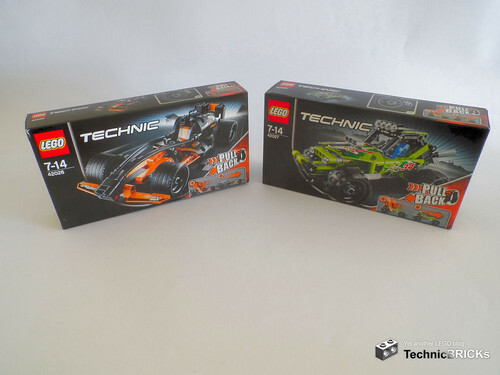 Both sets are more for play than for functions or parts (and therefore more suited to kids than adults), but they're fun and contain some interesting details.